There are books to teach kids how to count and to help them learn their alphabet, but I’ve never seen anything like these two board books from Tiger Tales. 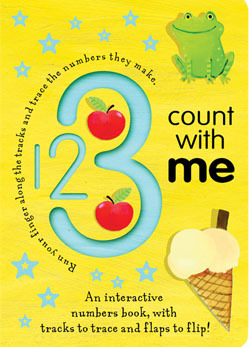 Proving they really know kids and how they learn best, 1 2 3 Count with Me and A is for Apple both illustrated by Georgie Burkett, take the learning one step further than other books. In addition to the delightful, eye-catching illustrations that are sure to make kids grin and giggle, each page in these books has grooved letters or numbers–as the case may be–so your child can trace the letter or number as you say it. Now, I’ve seen using shaving cream, salt or sand, to help kids learn in preschool and early elementary classes, so being able to trace here will help your child learn faster. Also included are lift-up flaps to reinforce learning. Take Number 1. The text says “one ball” and when your little one lifts the flap, she finds an adorable kitty underneath and the words, “and one fat cat,” on the inside of the flap. The back covers of the books offer parents helpful hints on how to help children learn more from the books. What I also like is the continuity between the two books. In 1 2 3 Count with Me we see the fat cat under the first flap. She also happens to be the fat cat that is on the cover of A is for Apple, just like the hen in A is for Apple is featured on the back cover of 1 2 3 Count with Me. Many early books on counting stop at 10, but this book goes all the way up to 20. In addition, at the end of the book, all the numbers are featured again, with the grooves, so your child can trace from 1 to 20. What I like best about this one is it goes one step further and begins to teach the child simple math. We see a combination of numbers and pictures, with a lift up flap that shows the sum, the picture, and then the addition in words. Example: “1 + 1” with a ball featured over each number, then =. The number 2 is printed in bold on the top of the flap, so it is visible to the reader. Open the flap and you see a picture of two balls. Then the inside text says, “1 and 1 makes 2.” Then the final page of 1 2 3 Count with Me follows the same method, but instead of having the number printed in bold on the top of the flap, it is the picture of the items. So, we have “3 + 3” with three crayons above each; then =, and the top of the flap has 6 crayons on it so the reader can solve the problem herself. When the reader lifts the flap, a bolded number tells her if she is right, and then the text “3 and 3 makes 6” appears on the inside flap like before. I am so excited about these. I can see kids learning numbers and letters even earlier than before, giving them a head start in school. 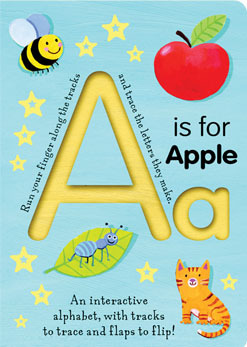 I highly recommend 1 2 3 Count with Me and A is for Apple.